"In every nook and cranny, high and low, they sought for him¿.He had vanished as a star vanishes when it drops from its place in the sky." From the author of such children's classics as The Secret Garden, Little Lord Fauntleroy, and A Little Princess, The Lost Prince is the enchanting story of a young boy discovering his true destiny. Twelve-year-old Marco knows he is being trained for something, but he isn't sure what. All his life he has traveled with his father in secrecy, learning many languages and the ways of a gentleman, but forbidden to speak about their country of origin, Samavia. Samavia has been fraught with war for the last 500 years, ever since the prince mysteriously disappeared. But now, there is hope that peace may come at last, as it has been rumored that a descendant of the lost prince may have been found. What a surprise treasure from one of my favorite children authors! Excellent read. Keeps you on your toes. 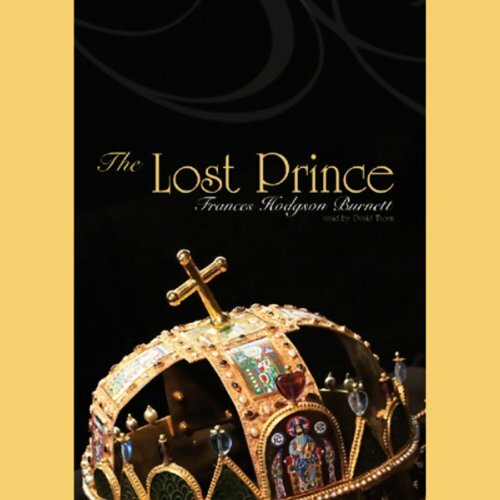 The Lost Prince seems like a natural progression after Little Lord Fauntelory for children, family, or teenage reading. During the first of part of the Lost Prince, you think you have it all figured out but then . . .what's real is not and what's not is real. David Thorn performed this tale as if he had written it; a once upon a time, gritty, long, long ago and definitely not a Shirley Temple version. His voice has a grand log fire, rocking chair, candlelight, weathered quality to it. One can hear the smile in his tones. I changed my mind a few times about this book. I finally settled on liking it, but it is not on par with "The Secret Garden" or "A Little Princess". However, many books I enjoy fall short of the merits of those works. In any case, Frances Hodgson Burnett was no sentimentalist. The story is set before WWI shook the foundations of many royal houses of Europe in a time of secret societies, assignation plots and counter plots. After showing themselves up to the task, the heroes, two young boys are sent on a mission carrying a secret message which signals the start of a revolt against a bloody tyrant of a small country. A bit surprising considering the period, one of the boys is a cripple, from polio I surmise. I don't recall another such in the role of hero from literature of the time. I love everything in it, I've never expected clsssic children story can be so engaging for adult like me. I'm venturing another by this author. It was very long for such a simple plot. However, it was quite the "cinderella story" in that it is a common childhood dream. There is alot of reference to buddist law & I didn't particularily like that. No foul language. Somewhat makes you think it is true history. I suffered through all 11 hours of this recording. I kept expecting to like the story eventually as I like many stories from this period and style. Sadly, I could never get into it. It always felt like the story was really happening somewhere else and the characters were just discussing it rather than part of it. One issue I found particularly annoying was the audio quality. Words and phrases suddenly sound like the speaker is in a tunnel and then back again. I've listened to dozens of other books on the same device with the same earbuds, so my conclusion is the recording itself is flawed. While the main narrator was OK (not good, but just OK), the chapter divisions are narrated by a different speaker and I did not like her voice.